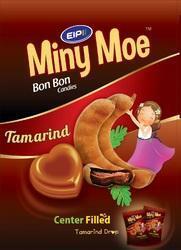 Pioneers in the industry, we offer eclairs flavoured candy, miny moe mint flavoured candy, miny fruit drops flavoured candy, miny moe dark fruit mint flavoured candy and centre filled tamarind candy from India. 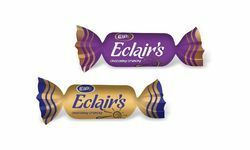 We are known to offer a premium and tasty range of Eclairs Flavoured Candy. Available in multiple sized packs, the candies are quality tested before the delivery. We are a brand completely acknowledged to maintain global quality standards in all our offerings. The candies are fairly priced and are well demanded in the industry. 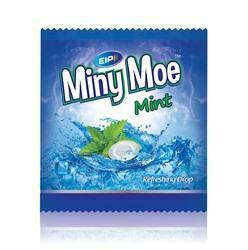 Our esteemed customers can avail from us a finest range of Miny Moe Mint Flavoured Candy. Deeply flavored these candies are highly demanded in the market for their rich taste and attractive packaging. We are offering them in multiple packs to better meet the requirements of the customers. Also we are known to follow competitive pricing models for all our offerings. 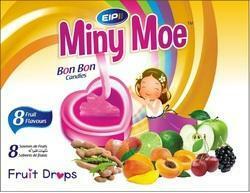 We have been offering a range of premium quality Miny Fruit Drops Flavoured Candy to our esteemed customer base. Widely acknowledged for their premium taste and rich quality, the candies come in a very attractive packaging. The products are valued for their premium quality and effective pricing. 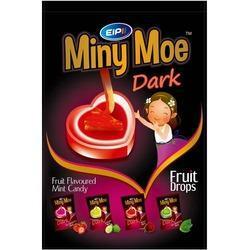 We have been engaged in the manufacture and supply of the finest quality range of Miny Moe Dark Fruit Mint Flavoured Candy. The products are very affordable and are offered after multiple quality checks. The products are offered in attractive packaging and are even regarded a premium gift. The products are offered at several quality checks and are of superior quality.